With a reputation for designing and building superior vehicle safety technology equipment, Innovative Safety Systems (ISS) is back at the Resource and Waste Management show with its innovative product range including Cyclear™, which has taken the industry by storm and is now arguably the market leading cyclist safety warning system. Testament to the success of Cyclear, Serco, one of the world’s leading public service providers has committed to fitting all 117 of its Refuse Collection Vehicles (RCV’s) that operate inside the M25 with Cyclear technology by 1 September in support of the Safer London Lorry Scheme. Serco is also keen to introduce the technology in other urban areas. In recent trials Amey, the waste collection, cleansing and recycling provider for the City of London Corporation, awarded the highest possible scores for Cyclear and the ISS four-way camera system. City of London Corporation is a CLOCS (Construction Logistics and Cyclist Safety) champion and FORS (Fleet Operator Recognition Scheme) Gold Accredited. The Cyclear system comprises an illuminated sign and speaker to alert cyclists and vulnerable road users when a vehicle is turning left. 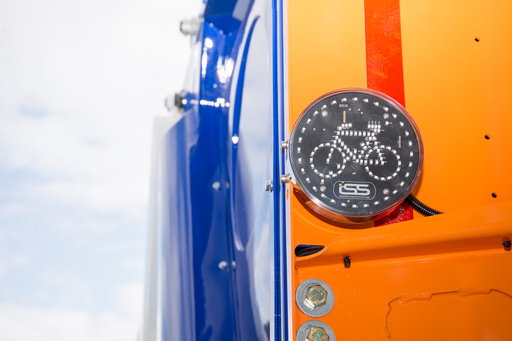 An optional sequencing sensor alerts the driver when a cyclist or pedestrian is approaching and filters out the false alarms that plagued its predecessors. Vehicle operators can use one or both elements of Cyclear installed on their fleet depending on specific requirements and budget. The ISS product portfolio includes reverse camera systems, LED vehicle lighting, Reverse radar systems, Hard Disk Recording (DVR) and LANlink that enables vehicle operators to be able to download recorded footage remotely and automatically, by WiFi, as each vehicle returns to the depot. With no monthly LANlink is a cost efficient and reliable solution, which also produces a daily health report for every camera and recording device on each vehicle, so any faults can be addressed immediately. For further information about Cyclear, LANlink or any other ISS product contact ISS on tel:02476 442699 or visit www.iss-international.co.uk.